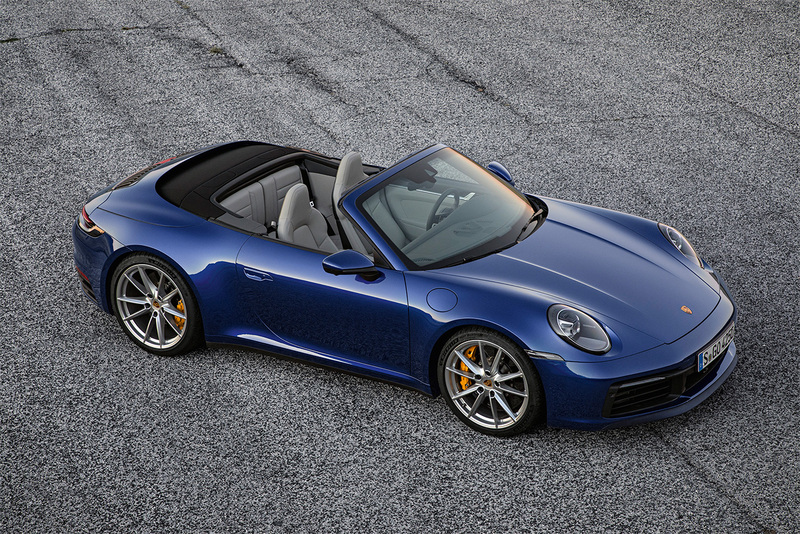 Six weeks after the Coupe’s launch, Porsche has unveiled their new 911 Cabriolet. 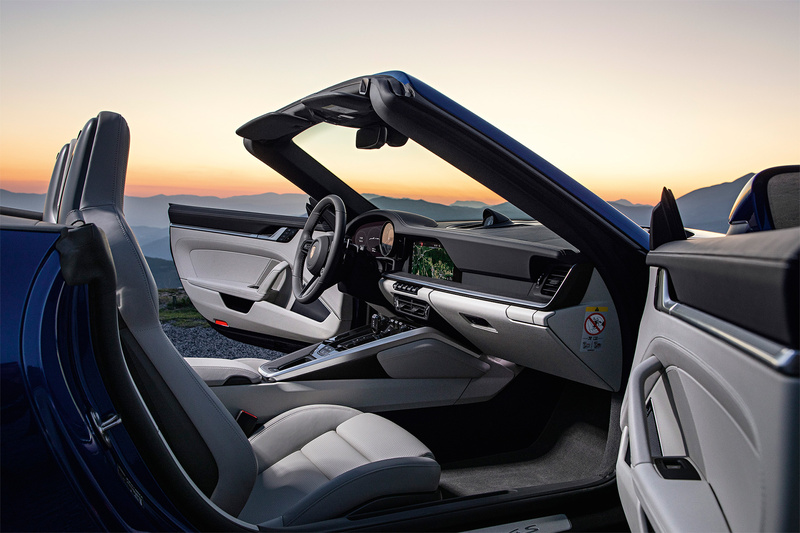 The fully-automatic soft top has an integrated glass rear window, while the soft top structure contains magnesium surface elements known as bows, which prevent ballooning of the roof at high speeds. The soft top can be opened or closed at speeds up to 50 km/h. New roof hydraulics reduce opening time to about twelve seconds. 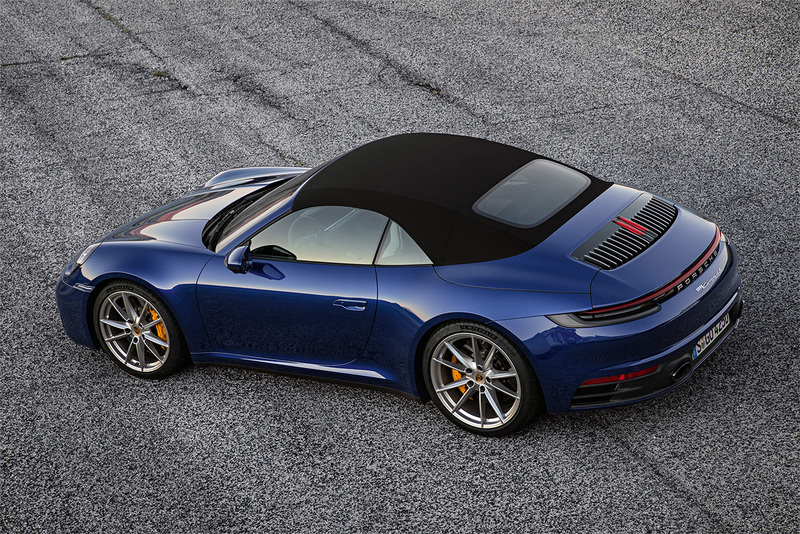 The 911 Cabriolet is initially available as a Carrera S with rear-wheel drive and Carrera 4S with all-wheel drive. Both are equipped with a 3.0 litre turbocharged 6 cylinder boxer engine which generates 443 hp and 390 lb-ft of torque. Drive efficiency has been increased and emissions reduced by improving the injection process; other optimisations have been implemented including a new layout for the turbochargers and charge air cooling system. The power is delivered to a newly developed 8 speed dual-clutch transmission. 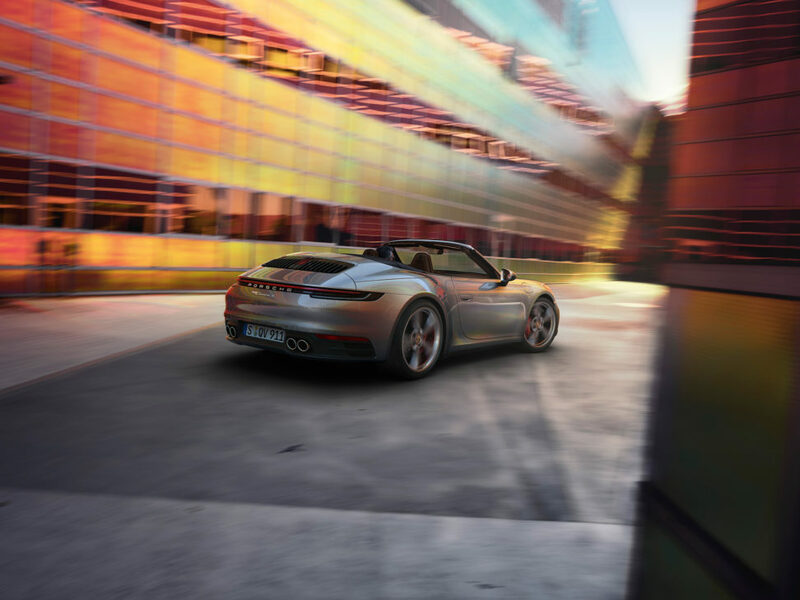 The Carrera S accelerates from 0-100 km/h in 3.9 seconds, 3.7 seconds when equipped with the optional Sport Chrono Package. Top speed is 306 km/h. Top speed of the Carrera 4S is 304 km/h and can accelerate from 0-100 km/h in 3.8 seconds, or 3.6 seconds with the optional Sport Chrono Package. The new engine mounting position makes the Cabriolet more torsionally rigid than its predecessor. 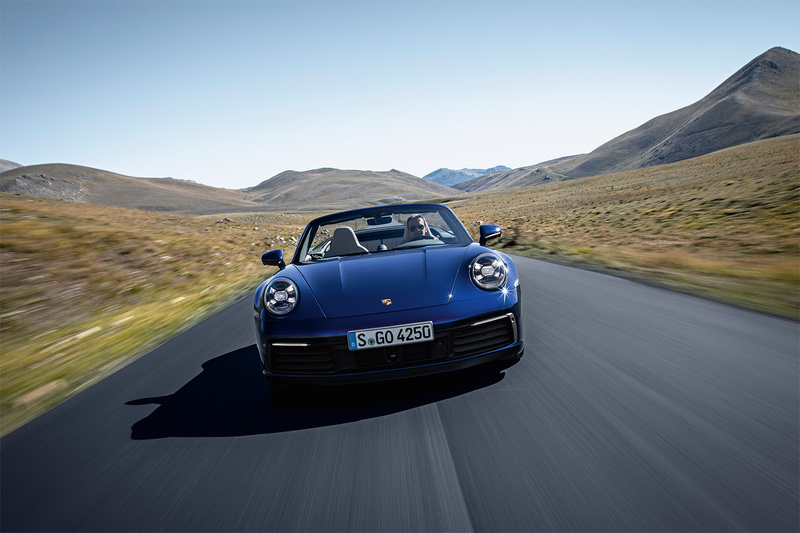 For the first time, Porsche Active Suspension Management (PASM) sport chassis is available for the 911 Cabriolet. The springs used for this are harder and shorter, the front and rear anti-roll-bars are more rigid, and the chassis overall has been lowered by ten millimetres. These adjustments give the 911 a more neutral feel on the road, with better weight distribution. Porsche unveiled the prototype of the first 911 Cabriolet at the International Motor Show in Frankfurt in September 1981. The first open-top 911 rolled off the production line in 1982, and it has been a constant feature in the model range ever since. 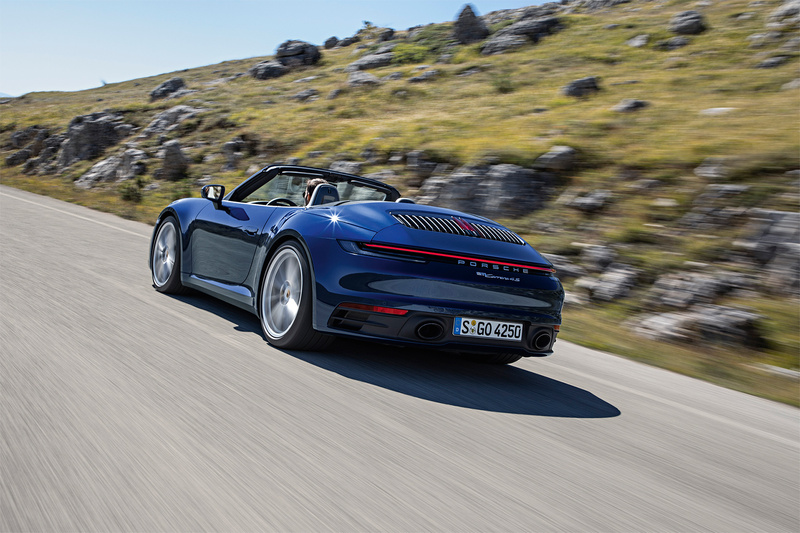 The new 911 Cabriolet looks wider and more muscular than its predecessor. Wider wings arch over the large 20-inch wheels at the front and 21-inch wheels at the rear. The rear-wheel-drive models now match the bodywork width of the existing all-wheel drive models. The rear axle is 44 mm larger. The rear of all models is dominated by the significantly wider, variable-position spoiler and the continuous and seamless light bar. With the exception of the front and rear sections, the entire outer skin is now made from aluminium. Canadian pricing for the new 911 Carrera S Cabriolet starts from $143,700 and $152,100 for the 4S Cabriolet. Delivery is scheduled for the third quarter of 2019.